Subtitles	- SDH support for the deaf and hard-of-hearing as well as improvements to viewing and selecting subtitles. Sarcastic? It's how I watch practically all video now. Says you. I don't know about you but I use ATV a lot. More than my cable-box. I as well. I cut the cable years ago and now use apple tv exclusively. Very useful in my house. Come on apple, still needs HBOGO and a handful of other streaming services. Riots at the factory, release a software update. Software engineers are supposed to break up a riot half way around the world? Thumbs up for being allowed to switch iTunes accounts! Up to now our ATV had shut out my wife and daughter, who have their own accounts and music. When is the App store coming? Then I might go out and buy one! Same here, my wife and I love it. We haven't had cable for two years now and we're never going back. I can purchase an entire season of 2 or 3 of my favorite shows and it's less money than 1 month of cable. I wasn't sure how useful I'd find the Apple TV, but for $85 refurbished I decided to give it a shot. I love the thing. It's got a great interface, gives me access to my ripped DVDs (I like it better than Plex, and I really like Plex), Netflix, MLB.tv... Also Airplay is a killer feature - we're actually playing around with using it for various things (such as presentations) at work. 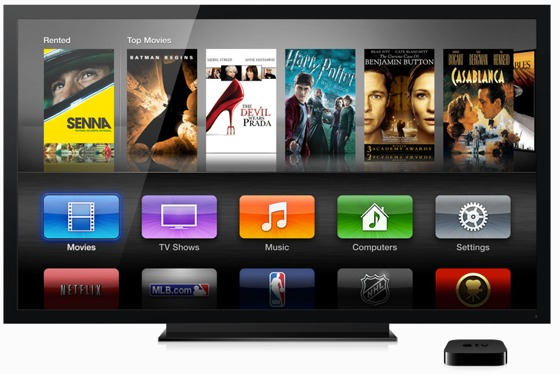 The Apple TV may be "just a hobby" for Apple, but it's definitely a great product.